Although the Great White North is best known for its hockey and lacrosse, running has seen thriving growth over the years in Canada. From 5Ks to ultramarathons, let’s take a look at some of Canada’s most popular running events. With distances ranging from shorter than a 5k to as long as an ultramarathon, trail races are characterized by off-road paths that give runners the chance to commune with nature and get some mud on their shoes. •	Course: A 125-kilometer loop begins and ends at a 4,200-foot plateau, traveling over three mountain summits and a river crossing where the Smoky and Sulphur Rivers meet. •	With over 17,000 feet of elevation change, extreme weather, and long distances between aid stations, this race is recommended only for those have fully prepared physically and mentally. •	Course: A 12.5-kilometer loop takes runners over rolling terrain. •	The largest trail race in Canada, the Run for the Toad offers a surprisingly intimate atmosphere thanks to the care and attention to detail displayed by the race directors, George and Peggy Sarson. While they’re not the same length as a full marathon, these races still offer plenty of history, challenge, and fun. •	Course: Starting at Hamilton Harbour, the route following the shores of Lake Ontario. •	The Around the Bay Road Race was originally run in 1894, three years before the Boston Marathon, making it the oldest road race in North America. Filled with tradition, the race remains a challenging run to this day. •	Course: Take all the staircases connecting Upper and Lower Quebec City—about 30 staircases, totaling over 3,000 stairs. •	If that doesn’t sound like enough of a physical test, the race offers three challenges: best overall time, best climber (fastest time up the 398 steps of the last staircase, the Cap-Blanc), and best sprinter (fastest time along the 1.5 km after the last stairs). Get ready to feel the burn. •	As a fundraiser for the Kinston Symphony Association, the Beat Beethoven Run challenges racers to complete the 8-kilometer course in 50 minutes—the time it takes the Kingston Symphony to play through Beethoven’s Third Symphony. •	Course: A 20-kilometer trail starts at the Cape Spear National Historic Site, passes over three major hills, runs along historic St. John’s Waterfront, and ends with an uphill mile to Cabot Tower. •	Described as the toughest race in Eastern North America, Cape to Cabot offers a mere 3 kilometers of flat terrain, but the rough trail is worth it for the breathtaking views and the fact that you get to cross two National Historic Parks. Measuring a full 42.2 kilometers, marathons are not for the faint of heart, requiring months of training your body, mind, and attitude. •	Course: A downhill trail starts at Mel Lastman Square and finishes at Ontario Place. •	The first Toronto Marathon was held in 1977. Today, the Toronto Marathon is certified as a qualifier for the Boston Marathon, and thanks to its downhill path, the marathon is one of the fastest courses around with many runners posting their best times here. •	Course: A natural route takes you through Pacific Rim National Park Reserve and finishes in the village of Ucluelet. •	First developed as a solution to the community’s downturned economy, the marathon has since become a celebration of natural beauty and health, welcoming upward of 2,500 visitors each year. •	Course: A fast, scenic path travels through well-known neighborhoods and popular landmarks. •	First held in 1975, the Ottawa Marathon has grown to become the largest marathon event in Canada. The marathon offers an excellent course for first-timers with its great views, few elevation changes, and overall positive atmosphere. •	Course: Starting at Dofasco Park, the route follows the backcountry roads of Hamilton to the Red Hill Expressway, turning toward Burlington and the Waterfront Trail. •	The Hamilton Marathon is ranked as the #1 Boston Marathon qualifier in Canada, offering a fast track hosted by countless charitable organizations. The Great White North is known for its beautifully snowy wilderness, thriving urban cityscapes, and an inherently diverse history and culture, but it has had a large tradition of athletes who have shown amazing feats of strength, grace, endurance, and physical acumen. Let’s take a closer look at some of Canada’s greatest athletes. 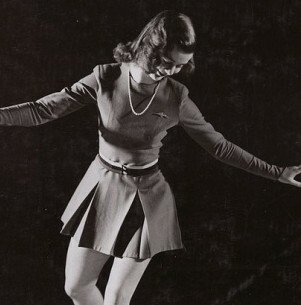 Born and raised in Ottawa, Barbara Ann Scott was the first North American to win European and world championships in figure skating in 1947, but her true victory came at the 1948 Olympics in St. Moritz where she became the first Canadian to win a gold medal in singles figure skating. Providing a welcome distraction from the ravages of World War II, the then 19 year old became Canada’s Sweetheart, giving the nation the courage and strength to get through the darkness of the postwar.Scott’s specialty was compulsories—tracing figure-eight variations—but she was adept at leaps and spins. At the age of 13, Scott was the first female skater to successfully execute a double lutz in competition. She retired from professional skating at the age of 25, but her legacy in Canada and figure skating as a whole remains today. 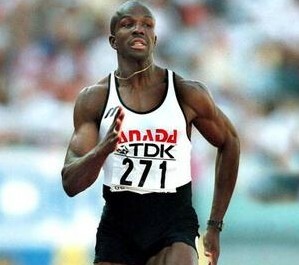 Born in Jamaica, Donovan Bailey moved to Canada in 1981. Bailey began sprinting competitively in 1991, though he split his time between running the track and nurturing a career in finance as a stockbroker. In 1995, Bailey competed in his first major international competition at the World Championships, winning gold medals for the 100 meter sprint and the 4×100 relay.Leading up to the 1996 Summer Olympics, Bailey set a world record of 5.56 seconds in the 50 meter, and at the Summer Games, he set his name in stone by winning the 100 meter competition with a world record of 9.84 seconds, a record he still maintains in Canada. 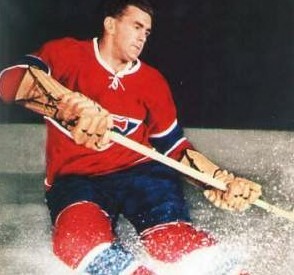 You can’t talk about Canadian athletes without mentioning Wayne Gretzky. Easily recognized as one of the greatest hockey players in history, Gretzky started his successful career with the Edmonton Oilers in 1979, quickly dominating the competition. In his first season, Gretzky collected a jaw-dropping 51 goals and 86 assists, and that was just the beginning. 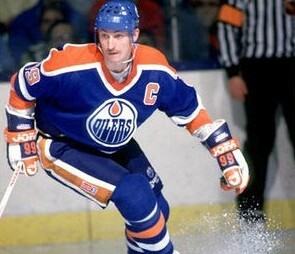 Gretzky helped the Oilers earn four Stanley Cups in 1984, 1985, 1987, and 1988.Gretzky currently holds or ties for 61 NHL records, including most career points, most career goals, and most career assists, and remains hockey legend. For Ray Downey, boxing was a family business. His father held the Canadian middleweight title for eight years and his cousin won a gold medal in the featherweight division. Ray debuted in the international ring at the World Junior Championships in 1983, where he placed fourth and was selected to represent Canada in the 1988 Summer Olympics. 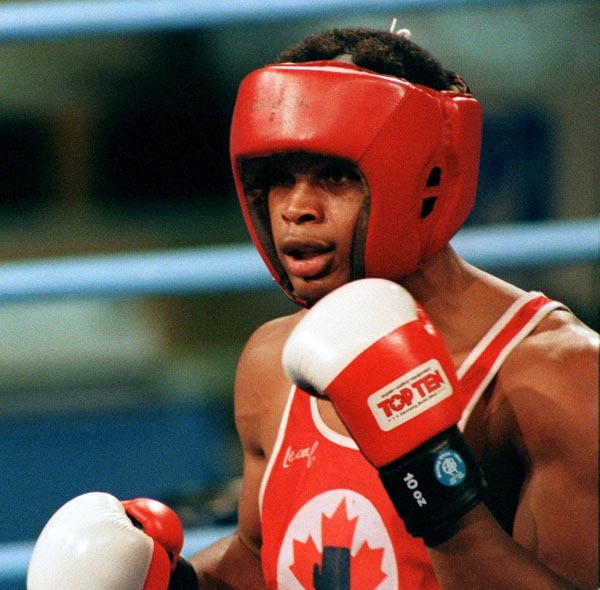 While he won the first four rounds, Downey lost in the semi-finals, earning a bronze medal.Downey won a silver medal at the 1990 Common Wealth Games and went professional in 1993. He retired in 2000 with a record of 16 wins, 2 losses, and 1 draw. 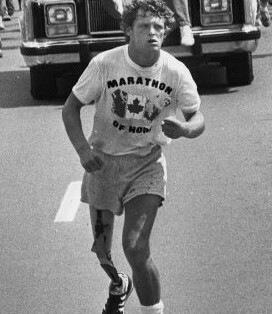 Terry Fox was just an 18 year old studying at Simon Fraser University when he was diagnosed with bone cancer. To prevent the spread of the disease, he lost his right leg, but he was far from defeated. After 14 months of intense training, Fox planned a run across Canada sponsored by the Canadian Cancer Society to raise money and awareness for cancer research.Fox began his Marathon of Hope on April 12, 1980, and averaged about 26 miles a day. The country watched, cheering him on for 143 days, until he felt sharp pains in his chest. He was just outside of Thunder Day, Ontario. The cancer had spread to his lungs, and Fox returned to Vancouver for treatments but ultimately lost his battle with cancer on June 28, 1981. While he didn’t complete his Marathon of Hope, Fox raised $24.2 million for cancer research and his memory continues to inspire millions of people all over the world. Rick Hansen was always an avid outdoorsman and an active athlete, holding a particular love for basketball and volleyball. In 1973, Hansen sustained a spinal cord injury in a car accident, paralyzing him from the waist down, but that didn’t stop him from enjoying his active life.Hansen enrolled in the University of British Columbia in 1976, and became the first person with a physical disability to graduate with a Physical Education degree. He became a pioneer in Canadian wheelchair basketball, leading the British Columbia team to 6 national championships from 1976 to 1982. 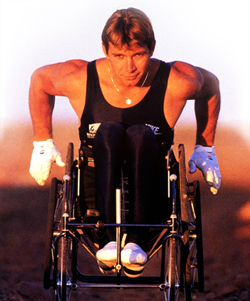 In track, Hansen won 19 international wheelchair marathons, 9 gold medals at the 1982 Pan Am Games, gold and silver medals at the 1984 Paralympic Games, and 3 world championships. Hansen made history during his Man in Motion World Tour by wheeling through 34 countries to raise money for spinal cord injury research and help communities become more inclusive and accessible to all. 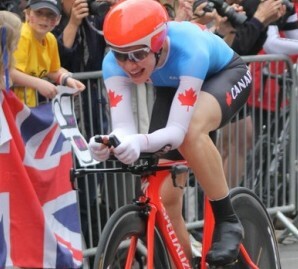 Clara Hughes is one of the only athletes to win medals in both the Winter and Summer Olympics, winning praise in speed skating and cycling. Hughes started as a speed skater, but her first success came in cycling with her first of eight medals at the Pan-American Games in 1991. She won a silver medal in the 1995 World Cycling Championships, followed by two bronze medals at the 1996 Summer Olympics. She even competed in the women’s Tour de France!Hughes has shined even brighter in speed skating. She won a bronze medal in the 500 m during the 2002 Winter Olympics. From 2003 to 2009, Hughes earned six medals in the World Championships: 1 bronze, 4 silver, and 1 gold. She holds the Canadian record for the 10,000-meter event. Born in Ottawa and raised in Toronto, Patrick Chan dreamed of having a career on the ice early on. While he wanted to start with hockey, his parents urged him to take figure skating to develop his abilities on the ice, and the rest is history.Chan has won three world figure skating championships, two Grand Prix Final championships, and two Four Continents championships. At the 2014 Winter Olympics, Chan won two silver medals in team and men’s events. The great thing: he’s still young, showing potential for plenty more Canadian gold to come. 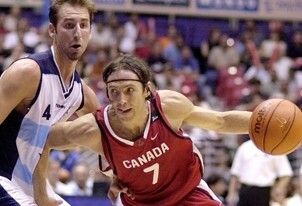 Canada isn’t well-known for its basketball, but Steve Nash helped pave the way by becoming one of the NBA’s greatest point guards in history during his formidable years spent with the Phoenix Suns. Known for his exceptional playmaking and ball-handling and his ability to knock down threes, Nash earned two MVP awards in his career and ranks as one of the top 10 players in NBA history in total assists, assists per game, and three-point field goals.With a hard work and the drive to succeed in something you love, you, too, could join these ranks as the next great Canadian athlete! If you enjoyed this article, be sure to check out our women’s running shoes to start your training to become the next best athlete!